The other day I got into a debate with my friend on what is better: smoothies or smoothie bowls. I think smoothie bowls win, hands down. They are just so much more versatile in terms of toppings and it is way more fun eating it with a spoon when thickened with frozen banana. The texture becomes almost like ice cream! In this smoothie bowl, I add frozen banana to frozen raspberries and coconut milk for a dairy-free alternative to milk or yogurt. You can top it with whatever you like, but fresh banana slices and oats are my favorite. 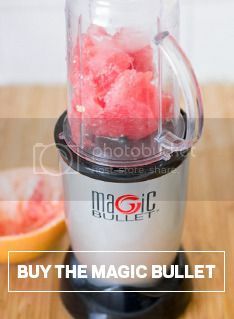 Add all ingredients except for toppings to a Magic Bullet cup and pulse a few times until thick and creamy. Top with fresh fruit, oats, seeds or whatever you desire.